Archive for the ‘Google Video’ Category. Google has entered the tech support arena: http://www.teachparentstech.org/watch The short help videos are slick, and they’re appealing, at least to the target audience: a younger generation that is very tech savvy with parents or grandparents who are not. One of my sons came across them and asked if I thought they would be helpful for his grandparents, who are in their 80’s. I went to investigate. The Tech Support care package is a set of quick videos intended to make using Google products easier. It makes sense. You have a product. You do a market analysis. Where can you expand? In technology, an obvious place to expand your market is the older adult population, which is the fastest growing segment of the population. But there are problems with that market segment (see my Connecting the Disconnected series of posts, as well as the Computers, Older Adults, and Libraries page). So Google, in a style very reminiscent of Apple, has created some help videos for basic computer tasks as well as for using Google products. They are short (good idea), to the point (good idea), and friendly (good idea). Some are good, some are fails. How to use the mouse, including the right and left buttons (or right and left side of the mouse). What the various special function keys are (such as the Control Key or Command Key) and where they are . How to browse a computer’s file structure. How to use email, including attaching files. How reasonable are these expectations? I fall back on the standard evasive answer: That depends. 🙂 I have developed a lot of computer training and taught a lot of people how to use computers. They have ranged in age from thirties to nineties. They have had varying levels of computer skills across all ages (although, in general, the older they are, the less computer skills they have). For those who had no experience with computers, my goal was to teach them how to use the internet, and how to use email. Once they reached that level, I could teach them more advanced things like bookmarking web sites, basic computer skills and file structure, and sharing photos. Some of these videos presume more skills than I did even for the next step beyond the new user level. For example, files and file structure, and email attachments were elements in our more advanced user classes. As an aside, Gmail was one of the email services we tested on the new user groups. It did not work out well, because (1) Google kept changing the service and interface, and (2) it was too confusing for a typical older user to figure out. I tried to contact Google about creating a user interface that would work for older adults. Obviously, I didn’t get their attention. How old is the recipient of the “Care” package? The older the person is (generally, 55+), the more they need explicit instructions, using discete steps. The visuals are nice, but sometimes they move too fast and skip over steps. Also, the language is often not explicit enough for an older adult. How experienced is that person with computers? This question is actually tied to the next one. Older adults do not tend to keep up with changes in technology as much as their children/grandchildren. But generally, the more experience they have, the less difficulty they have learning new, related skills. What operating system, and what version of the operating system, is that person using? Because older adults tend to not update their skills (learn why here), they are usually using an old computer and operating system (it was not uncommon to have students in my classes who were using Windows 98). The changes from Windows 98/2000/xp to Win7 or OSX Snow Leopard are intimidating to an older adult (again, generally, 55+). These videos assume the recipient will be comfortable using one of those operating systems. That is a big assumption. Bottom line: If the intended recipient of these cute care packages is under 55, and has some experience using a recent operating system, the videos will likely be both handy and useful. If the recipient is over 55 and/or is not using a recent operating system, a few of the videos would be useful: How to Create a Strong Password, How to Know if an Email is Real, and most of the Search Information videos. Also note, there are a lot more Mac-centric videos than Windows. Would it work for my parents, in their 80’s, who have been using computers since the first Apples came out, and currently have Snow Leopard? Actually, no. They would have difficulty following most of them, and for the rest, they wouldn’t see the point. It’s time to share the pain here. I have been trying to convert my presentation from the ALA preconference program two weeks ago to a video clip and make it available online, following a suggestion from Susannah Fox. 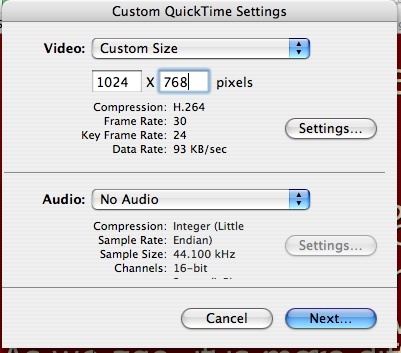 Converting it to a quicktime video wasn’t so bad, except that converting the whole thing creates a rather large file. So I decided to split it up. I finished part 1 and uploaded it to YouTube for a test, and linked to it from the North County Regional Library Sandbox to see what it looks like embedded in a page. Unfortunately, after many trials and gnashing of teeth, I have found that no matter how good the quality is, once the clip gets into YouTube, it is reprocessed and scaled down to a resolution of 320 x 264. The problem is that clips display in a larger window, so it has to scale back up, and becomes blurry. For anyone interested in a how to do it, Clay Redding pointed me to this post on Digital Life: From iMovie to YouTube a.s.a.p.. Although I was exporting from Keynote to Quicktime, I was then importing it into iMovie and exporting it again in different formats. 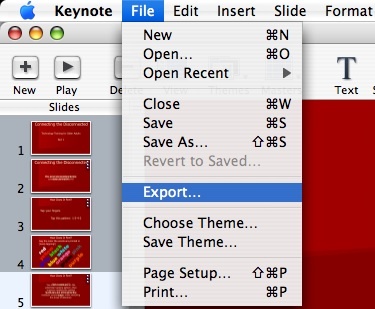 I finally just used the custom settings on the Keynote export window. It didn’t make any difference to YouTube. So I tried Google Video. As long as it displays at the “original” size, which is about half the size of the space it displays in, it is sharp. But like YouTube, it gets blurry when scaled up. First, note all of the options. Exporting to PowerPoint works fairly well, but you will have to do some cleaning up afterwards. PDF is good for creating a set of printed handouts. Images and HTML are totally useless if you have any animation, sound or builds in the presentation. I tried the iDVD option simply because I had never used it. It might be what you want if you like a pre-canned delivery with limited options after the fact. The Flash export actually worked very well for me, but unless you are uploading to your own website, rather than linking to an online service like YouTube, it is not much use. 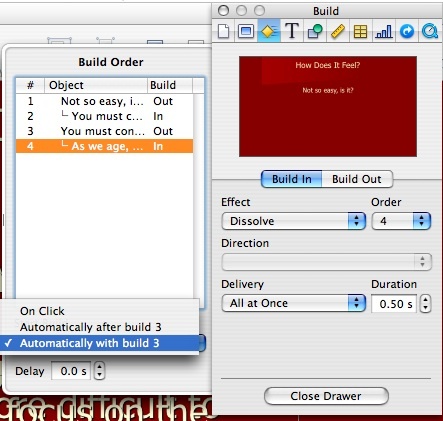 O.K, so once you choose Quicktime, you can get to the custom settings by clicking on the Formats drop down menu and clicking on “Custom.” The Custom Quicktime Settings window will automatically appear. 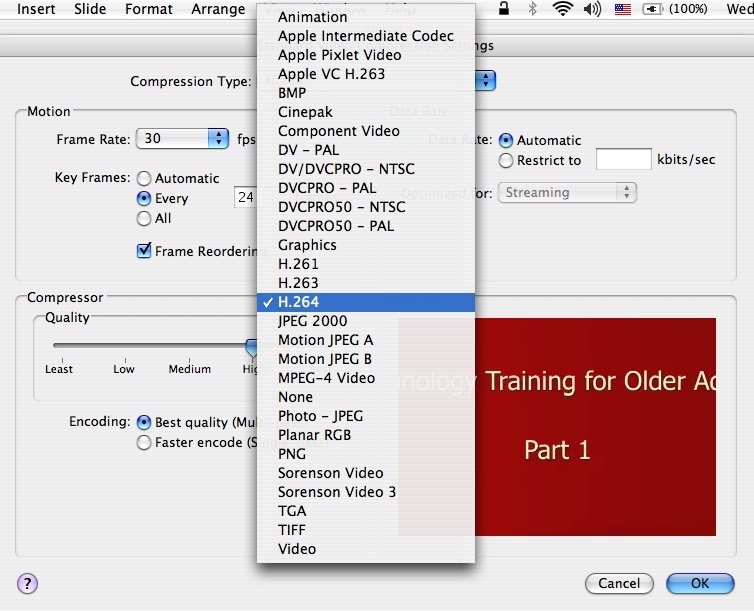 You can go with the automatic size settings, or choose “Custom” from the drop down menu for video (this part of the presentation did not have any sound, so I selected “No Audio”), and put in specific numbers. It helps to keep a 4:3 ratio (which gives 1.3333~ when the width is divided by the height). In fact, Google Video pretty much requires the 4:3 ratio. (Google Video requires at least 260 Kbps, but prefers 750). You can change the compression type; I tried some of the others, but the H.264 worked best for me. 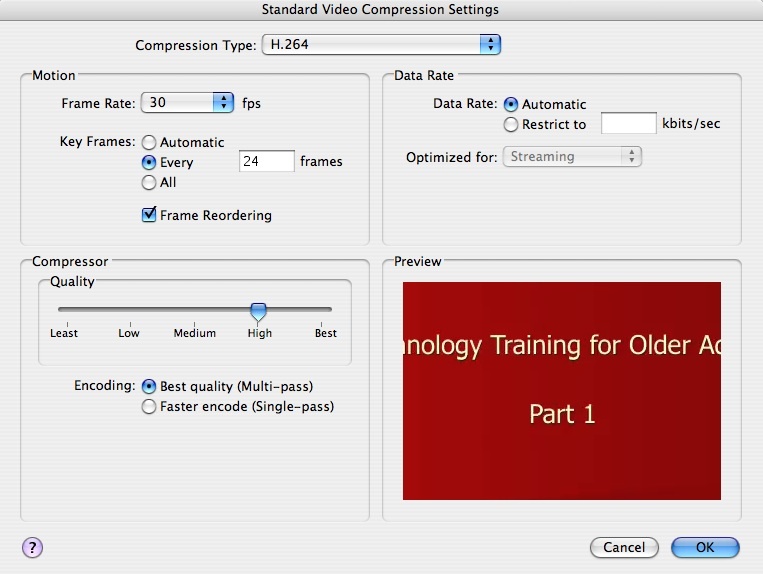 If you are going to import it into iMovie, you might be tempted to just use no compression. Don’t do this unless you are using a superfast processor with a gazillion gigs of RAM. It tries to create a file that is about 4 or 5 gigabytes (and that’s just from a small presentation), and will just freeze keynote.